The Wilson Brothers’ shows from this past winter were thoroughly documented in audio, video and photographic formats. Now the full experience is available for immediate download in two packages. Both download packages contain the same 22-song audio album plus liner notes direct from Dan and Matt. The Deluxe package features a few extras including copious photography from that weekend in Minneapolis and live vides of four songs. These 2013 show downloads can be explored from the column on the right side of this page. 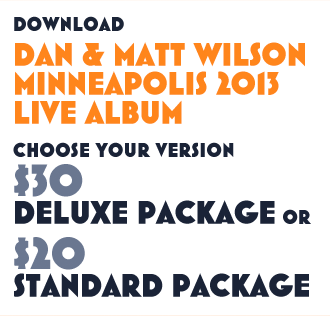 In addition, music from Dan and Matt’s 2010 Minneapolis show can be purchased as well further down the column. Dan and Matt Wilson Return for their second-ever Twin Cities duo show: at the Pantages Theater in Minneapolis, February 1st, 2013. The pair will play music from all (or most) phases of their illustrious pasts and presents, including songs by Trip Shakespeare, Semisonic, The Twilight Hours, The Love Monsters, and their solo recordings. The set will surely include some judiciously chosen covers and quite likely some new numbers as well. The brothers' first duo concert was documented in a download-album of the entire show, "Dan and Matt Wilson, Minneapolis 2010." See below for details. Tickets go on sale Friday, November 9 at 11:00 AM. 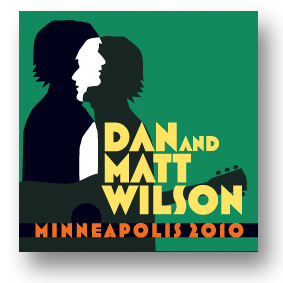 Download album, "Dan and Matt Wilson, Minneapolis 2010"
Back in March of 2010, Dan and Matt Wilson played a long-awaited show together at Minneapolis' Pantages Theater. Although the two brothers had been in bands together since their early teens, and had relentlessly toured the country in Trip Shakespeare, they had only done one concert together between 1994 and this year. The Wilsons had never played a show without a band: this was their first duo concert ever. When tickets went on sale for the gig, fans snapped them up in one short morning and many were left without a way to hear the show. Happily, the gig was recorded by the brothers' long-time sound mixer Brad Kern, and over several days, Brad worked feverishly to mix the files for immediate release. During the concert, Dan suggested that some of the chit chat and casual banter between songs could be edited out of the eventual live recording. But the audience weighed in strongly that the concert be reproduced in full, and it was decided. Two versions of the concert are now available: one is the complete audio mix of the show, the second version includes the audio plus a portfolio of rehearsal, soundcheck, and performance photographs and album artwork. Immediate download of 22 songs, credits and liner notes. Plus a portfolio of 28 high resolution photos of rehearsals, soundcheck, and live performance. Also contains a link to stream and download videos of four songs from the concerts. Downloads supplied via Bandcamp.com. An email with download instructions for the full album will be sent automatically to your email account directly following your purchase. DO I NEED TO BE A PAYPAL MEMBER TO USE PAYPAL? No. You can simply pay with any major credit card without signing up for anything. To pay with a credit card click the blue “continue” link above the credit card logos on the left side of the checkout page. HOW DOES THE DIGITAL DOWNLOAD PROCESS WORK? Immediately following checkout, an automatic email containing the download link will be sent to the email address you use when paying for the album. Normally, this will happen immediately but sometimes can take a few minutes to process. If for some reason you do not get the email or if you have any trouble, please contact grant@newartistdirect.com and we will make sure to send it to you manually. Once the download is complete simply double-click (mac) or right-click and select extract (pc) to unzip the file. The mp3 files can then be dragged into your media player of choice. PROBLEM DOWNLOADING THE LARGE FILE? If you’re unable to download the complete .zip file (due to a poor internet connection for example), simply email us the order number located on your confirmation email and we’ll send you download links for 3 smaller .zip files. The contents will be the same hi-quality audio, just divided into three separate files for easier downloading. RECEIVING WINRAR: DIAGNOSTIC ERROR MESSAGES WHEN EXTRACTING FILES ON A PC?